Mannofield Church would be very happy to welcome you and play a part in making your wedding day a special and significant occasion in your lives. 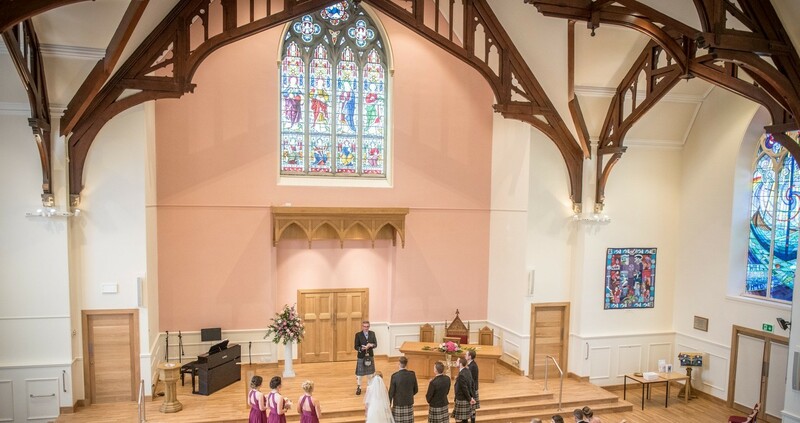 Choosing to have your wedding at Mannofield Church assures you of a spectacular setting, the guidance of a Minister who will lead you through the planning process and, along with other church staff, participate in your Service. In 2016 Mannofield completed a major refurbishment of the church building – both inside and out. The result is a building that while modern, light and airy continues to retain an atmosphere of stillness and reverence. The flexible seating allows the sanctuary to be configured in various ways. 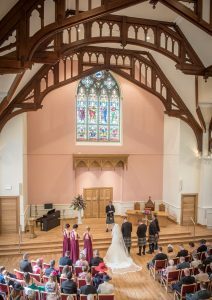 However, the seating is usually setup to provide a central aisle leading to the chancel which is used as the central staging area for the key segment of the wedding ceremony. Outside, the new landscaping provides a gathering area for guests and a suitable backdrop for photographs. Why be married in Church? Your wedding day is one of the most significant days of your lives. 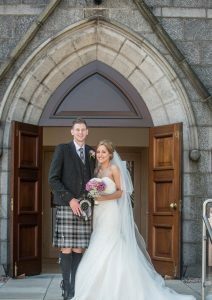 In Scotland it has been traditional for weddings to be conducted in churches by a Minister or Priest. This has partly been due to the association made between the ‘Gift of Love’ at the heart of a relationship that leads to marriage and the giver of the gift – God. The church believes that love between two people is not an accident or some encounter based on ‘chance’ or ‘good-luck’. We believe it to be predestined and the start of a journey that can lead to two people believing they are meant to spend their lives together in a relationship of marriage. The wedding ceremony builds on these themes and in so-doing adds a layer of holiness and affirmation to the legal process of getting married and to the celebrations involving friends and family that are typically associated with a wedding day. In planning for your wedding day the Minister will lead you through the process of making your Service unique but retaining the content that builds the sense of the part God plays in life and particularly within the relationships of love we have been gifted. An organist will be provided by the church and typically in consultation with the Minister you will choose two or three hymns for the Service and processional music for the beginning and end of the Service. One or two readings will be selected and these are often a combination of a religious text and a contemporary reading. They are often read by family or friends. Photographs and videos are permitted and guidance will be given as to the positioning of the photographer and videographer so that the taking of pictures and the video do not interrupt or detract from the Service itself. 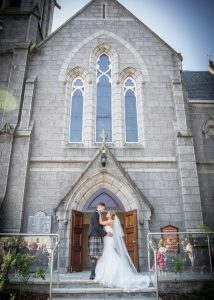 When completing the Wedding Booking Form you will be asked to consider giving permission for pictures of your choosing to be used by the church on the church’s social media platforms. This allows us to share news with the congregation of the events taking place within our church and also to promote the venue. Normally the church is decorated with a display of flowers and sometimes other adornments. The church does not provide flowers but is happy to work with florists or family in the setting up of the sanctuary for the wedding day. Please note that confetti of any type is not permitted either within or outside the church. You will be asked to pay a £100 non-refundable deposit at the time of making a booking. The balance is to be paid 6 weeks before the wedding. Payment can be made by cheque payable to Mannofield Parish Church or by cash or bank transfer. do you A…, give yourself to B……. and take her/him now to be your husband/wife?